Kate Spade caught my interest years ago with her simple nylon bags. Since then, the brand has expanded from bags into shoes, clothing and accessories. Anyway, from time to time SG will find super cute and interesting accessories at Kate Spade at fairly savvy prices. 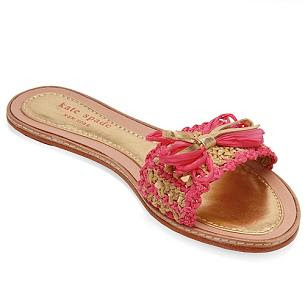 SG finds this pair of pink raffia sandals quite cute and quite feminine for the summer. And for $148, Amelia sandal is almost a savvy find. It's also available in black but pink is cuter for spring and summer. So let me ask, if a gal shall only pick one, which one is cuter, this or Kate Spade Amelia above? I am torn! While I am browsing, SG finds interesting jewel pieces which are fun and colorful. 2. Pink circle motif enamel bangle (2.5 inch wide) $98 --- Colorful enamel bracelets are very trendy now. 3. Gold coated beads necklaces $175 --- This necklace will be very stylish with an evening dress or casual tube or tank top with jeans. Hi there-these are really stylish picks, very nice indeed Savvy! kinda loving that disco ball ring! I like these pink sandals very mnuch and the jewel pieces and I really liked both black coats from your previous post you find the most beatiful things, SG. I really like those sandals. The color is very chic. I love Kate Spade and love those shoes! I own many Kate Spade bags. i fell in kate spade initially for her simple basic nylon bags. back in the days, i can only buy limited number of prada and kate spade is a great savvy choice. I love Kate Spade's advertisements. I didn't know she did more than bags. 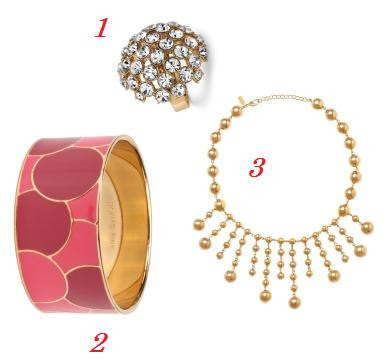 Kate Spade has a some really good accessories. Happy Friday! Ooooh #1 is my fav! I think Kate Spade's approach is clean cut,elegant and refreshing.I have always liked her nylon bags. I still have my first black Kate Spade bag, back from 6th grade! The jewelery is really nice. I love the necklace and ring. Kate makes some great jewelry and I also like her clothing line. I have a Kate Spade wallet that I love. Its probably the best one I've ever had plus it is so pretty!